Vitamin C contributes to maintain the normal function of the immune system during and after intense physical exercise. Vitamin C contributes to normal collagen formation for the normal function of bones. Vitamin C contributes to normal collagen formation for the normal function of cartilage. Vitamin C contributes to normal collagen formation for the normal function of gums. Vitamin C contributes to normal collagen formation for the normal function of teeth. Vitamin D contributes to normal absorption/utilisation of calcium and phosphorus. 6 months treatment pack as an important building block of bones! A product featuring the new algae technology. The first biologically renewable, purely plant-based calcium. HerbaCal™ is a natural, biologically renewable, high-quality sea algae complex containing more than 50 natural minerals and trace elements. HerbaCal™ comes in bioavailable natural form. The combination of natural vitamins and antioxidants makes it a number 1 product. Its natural form makes it easy for the body to absorb. HerbaCal™ is a complex of valuable magnesium, vitamins C, D and K2. It is suitable for vegetarians and vegans, too. HerbaCal™ is a natural, biologically renewable, high-quality sea algae complex containing more than 50 natural minerals and trace elements. 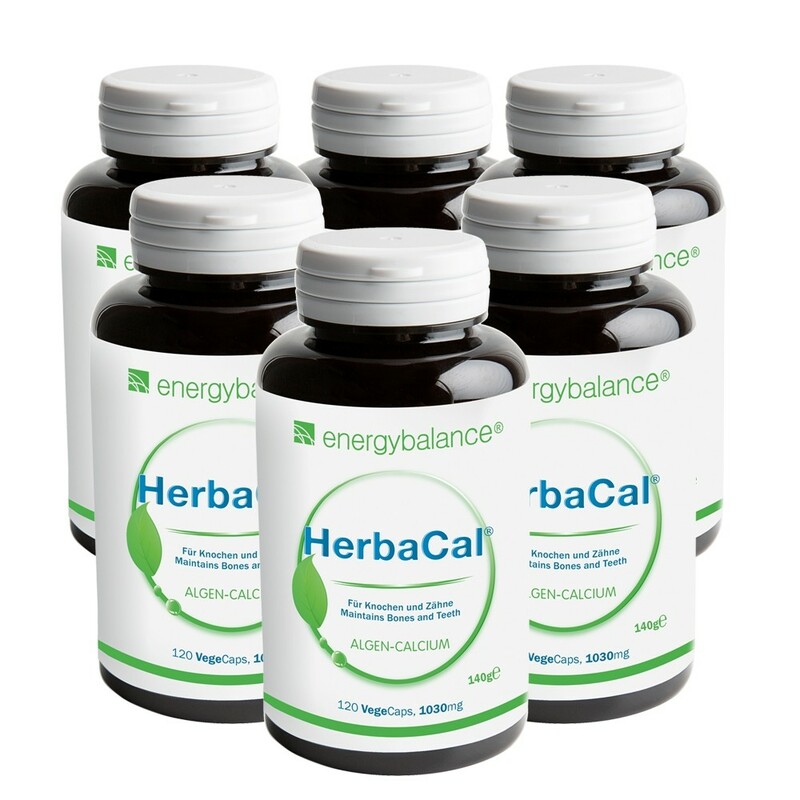 HerbaCal™ comes in the highest bioavailable natural form. The body absorbs HerbaCal™ much more effectively than most other forms of calcium like carbonate, dolomite, oxide, etc. HerbaCal™ calcium is 100% plant-based, is harvested using natural methods, is environmentally friendly, helps preserve the ecological balance and is regenerative in its natural form without harming the environment. HerbaCal™ is a plant-based product unlike calicum from oyster shells or coral, both of which are classified as marine animals. After the HerbaCal™ product is harvested, it does not undergo any chemical treatments or sieving. We do not add any additives that could contaminate the product. Each batch of HerbaCal™ is tested in the lab for toxic materials, so you can benefit from this natural resource without cause for concern. HerbaCal™ is a 100% natural plant-based product, which makes it suitable for vegetarians and vegans, too. Which type of calcium does your body absorb more effectively? 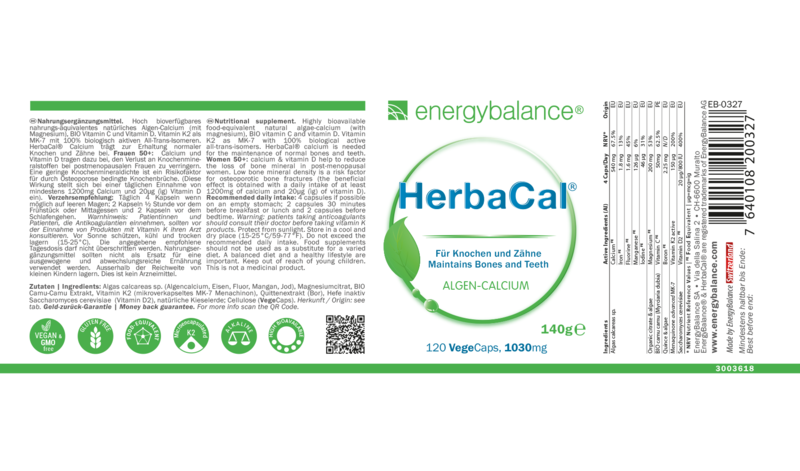 HerbaCal™ plant-based calcium from algae is considerably more effective than the calcium carbonate or calcium oxide that you find in most products. Magnified under a scanning electron microscope, you can see why the plant-based calcium in HerbaCal™ is more bioavailable. The considerably more facetted surface texture of HerbaCal™ actually has more "points of contact" on the surface and is comparable to the surface of a natural sponge. In contrast, calcium carbonate, which is pictured below in the black-and-white image, has a surface structure similar to that of crystal with smooth peaks. Calcium carbonate has less total surface area as well as lower bioavailability, making it less effective. The advantages of HerbaCal ™ include its higher bioavailability and effectiveness. According to studies, HerbaCal ™ is 200% to 300% more effective than other forms of calcium on the market. Is an important component/building block of bones and teeth. Calcium plays a key role in nerve impulse transmission and is an essential mineral for healthy bones and strong teeth. Is a component of bones and teeth and plays a key role in energy metabolism. Magnesium is essential to normal muscle function and energy metabolism. Magnesium plays a role in skeletal structure and a key role in transmitting nerve impulses during muscle contraction. Helps maintain healthy bones, teeth, gums and blood vessels and helps the body absorb iron. Vitamin C is an antioxidant. Helps maintain healthy bones, especially in children and seniors. Vitamin D regulates the absorption of calcium and phosphate. The liposoluble vitamin K, also called menaquinone MK, is known to be an essential nutrient for combating blood clotting, as the synthesis of different blood clotting factors is dependent on vitamin K. A vitamin K deficiency can lead to haemorrhaging. The letter ‘K’ stands for the German word ‘Koagulation’, meaning coagulation or clotting. However, there is only one vitamin K2 molecule which prevents heart attacks and calcification of the blood vessels, reduces existing build-ups or can increase bone density. This active vitamin K2 molecule is able to combine carbon with osteocalcin or a Gla matrix. This process is called activation. If both of these proteins are activated, osteocalcin can store calcium in the bones or the protein Gla matrix can remove calcium from the soft tissue. EnergyBalance™ vitamin K2 consists of the best MK7 form and is still protected through microencapsulation. In addition, only the 100% biologically-active form is used and declared in EnergyBalance™ Vitamin K2 is completely made up of the active MK7 all-trans isomer, which has the highest level of bioavailability and can provoke therapeutic effects. 6 months treatment pack: 6x140g = 120 vegecaps each containing 1030mg of highly bioavailable HerbaCal™.